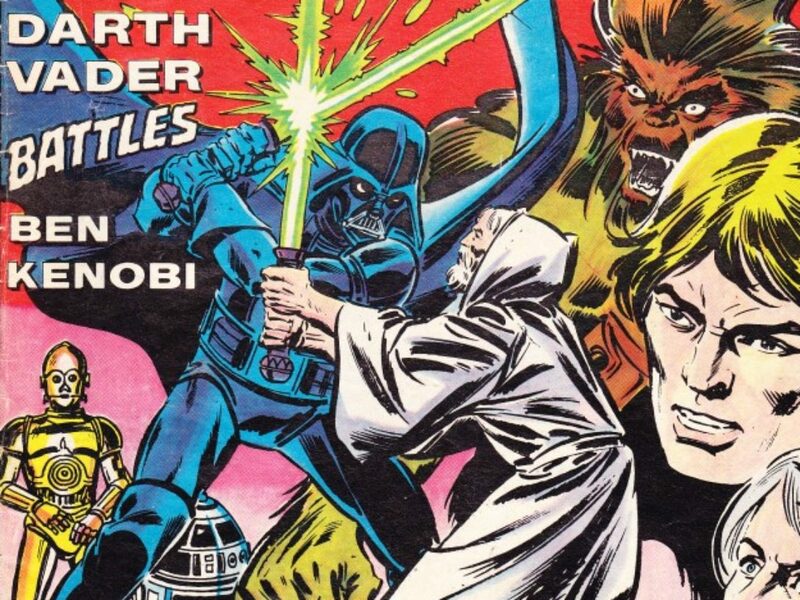 Revisit Marvel's classic UK comic, which continued its adaptation of Star Wars, featured fun offers, character guides, and more. 19th April 1978. Sounds like a lifetime ago…heck, it IS a lifetime ago, but even as far back as 38 years, the spirit of Star Wars was Wookiee strong. 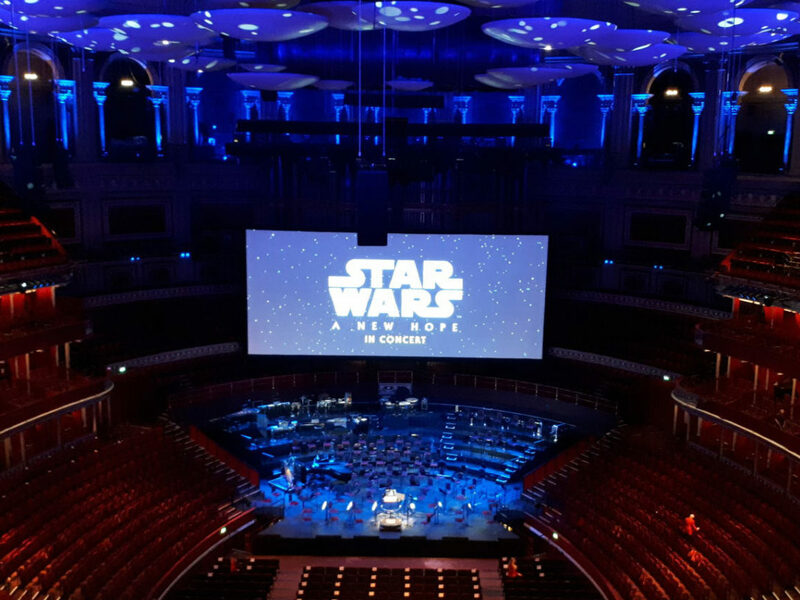 The world was learning new things about the film, even though few besides George Lucas believed it would truly go on to become a saga. 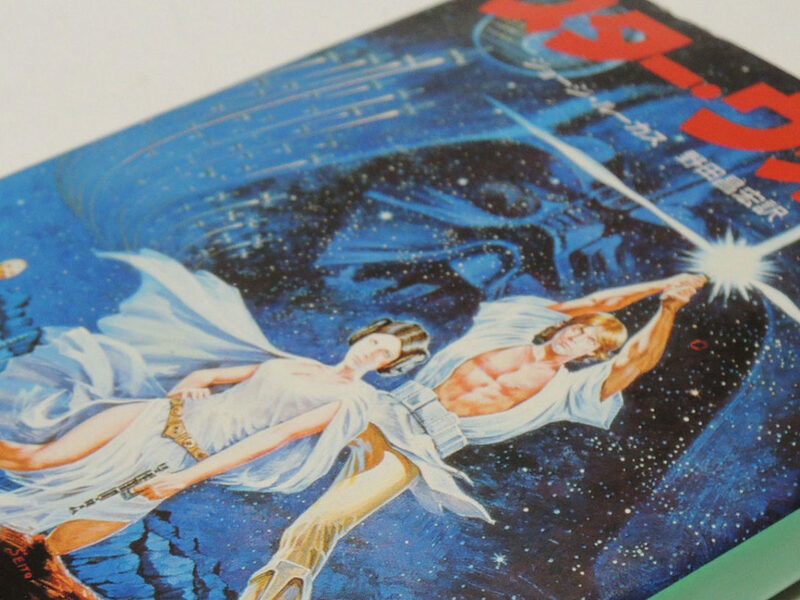 Every day, kids hungry for information sought fuel for their imaginations and would voraciously buy anything with the Star Wars logo on it. 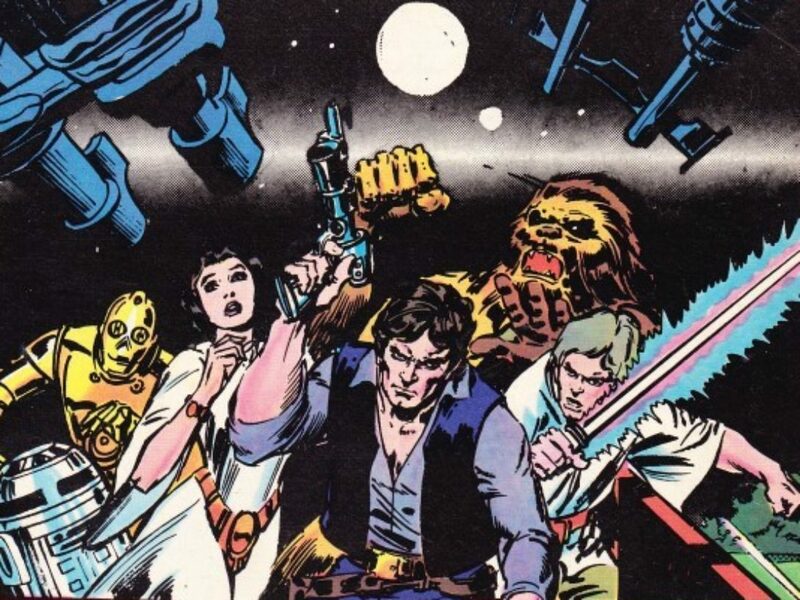 A record 63,500,000 shares may have been traded on the New York stock exchange on 17th April, but right then, Star Wars was the best license to print money on the planet. While we were dreaming of sandy worlds, metal moons, winsome warriors, and feisty princesses, what was the soundtrack of the day? Here in the UK, “Matchstalk Men and Matchstalk Cats and Dogs” still sat on top of the pile for a third week while “Night Fever” by the Bee Gees leapt up 14 places to number two. “Wishing on a Star” by Rose Royce completed the top three, while in the album charts, 20 Golden Greats by Buddy Holly and the Crickets was number one for a third week with ABBA The Album at 2 and The Kick Inside by Kate Bush at 3. Over the next three days, George A. Romero’s Dawn of the Dead and I Wanna Hold Your Hand by Robert Zemeckis and Bob Gale would be released in US cinemas. 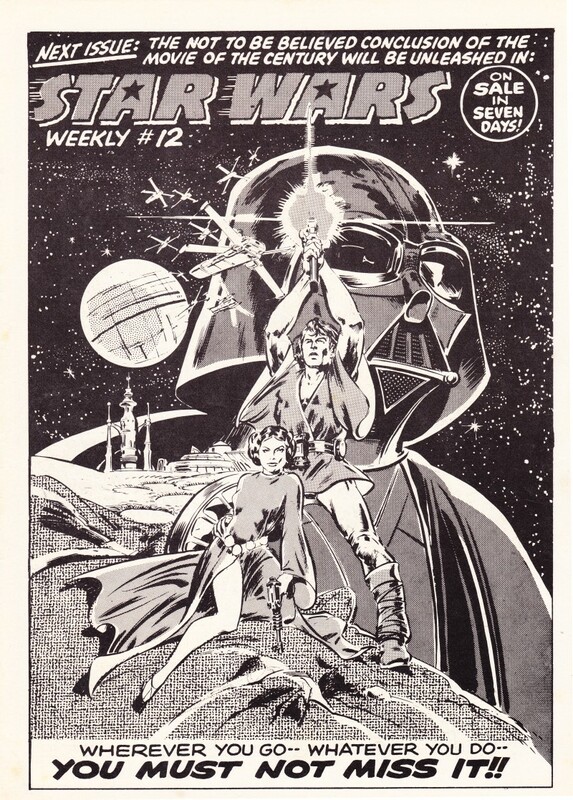 Fitting, especially as we are about to go back to the future and check out issue 11 of UK Star Wars Weekly. Hop across the page and it’s our summary of the story so far. 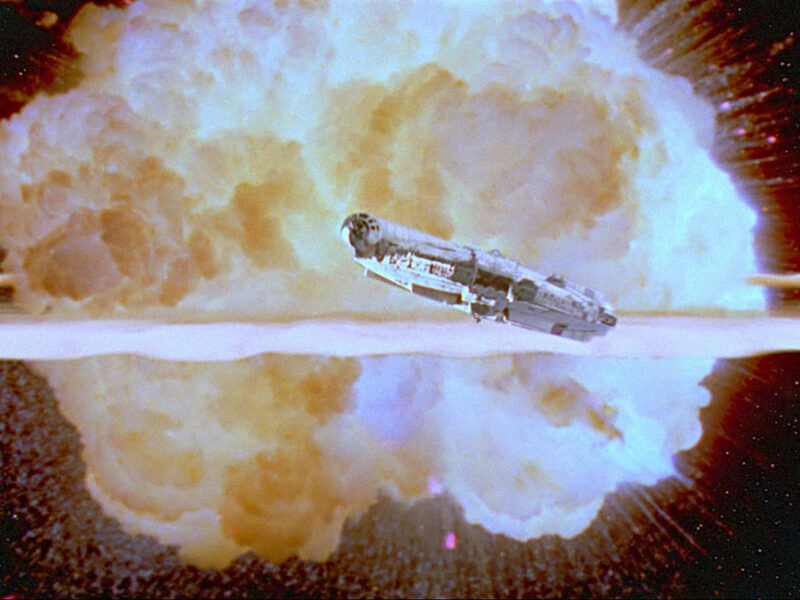 We see Leia’s agony as her homeworld of Alderaan is destroyed before her eyes and watch as the Falcon is pulled into the Death Star. 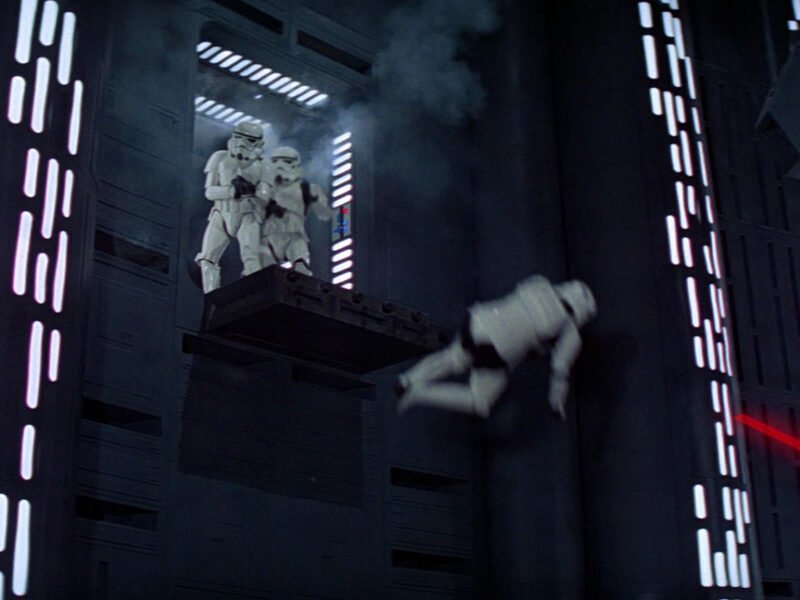 Luke and Leia swing across the metal canyon and Luke — a part of Blue Squadron, prior to its change to Red Squadron — is sitting in a very snub-nosed X-wing about to attack the Death Star. “It’s DO OR DIE! !” yells Blue Leader, and he’s not kidding. 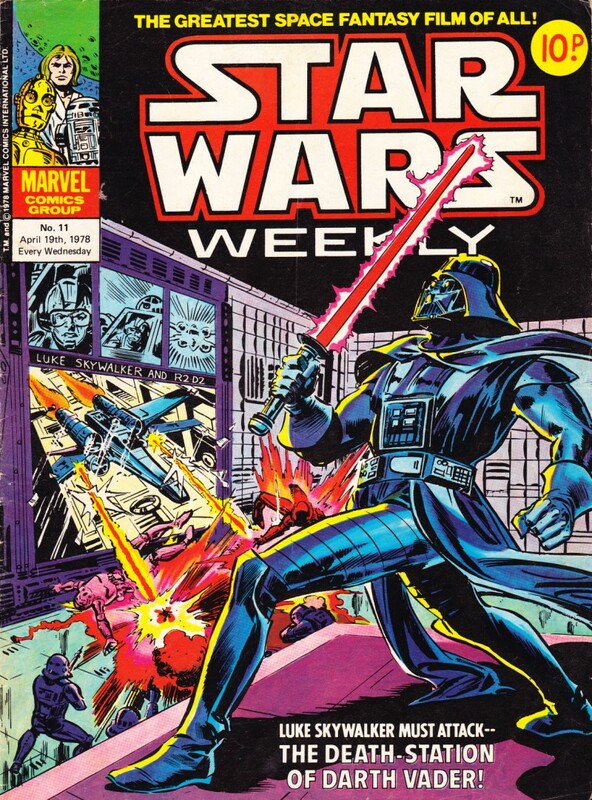 Written and edited by Roy Thomas with art by Howard Chaykin and the legendary Archie Goodwin as consulting editor, it’s a blast through the trenches of the Death Star run. 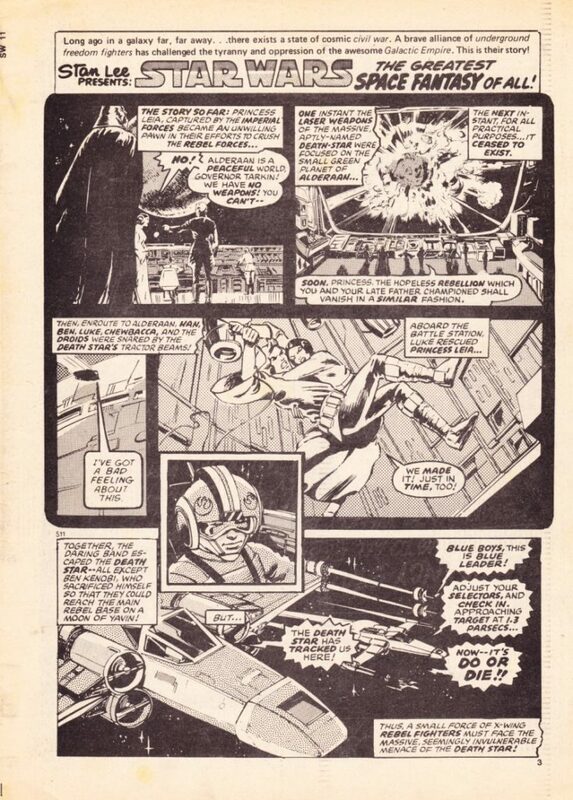 We lose Blue Six (also known and referred to in the comic as Lt. Tono Porkins) and Biggs remembers his friend, calling him “Piggy.” Vader enters the fray, taking out Blue Leader and we end as Luke, Wedge, and Biggs prepare for their second, historic run. Yes, I was definitely a space cadet (some would say I still am), and a headline like that would scream to my 7-year-old self to do what the man said and place an order with my newsagent. Back in the day, it was often the case that your surname would be written in unforgiving ink on the top of your comic, so any hopes of having a mint condition run of the title was lost. I didn’t care, I just wanted the comic every week! The bottom half of the page hyped the Official Collectors Edition, 80 glossy pages for 95p, but it was the next page which really did the trick. 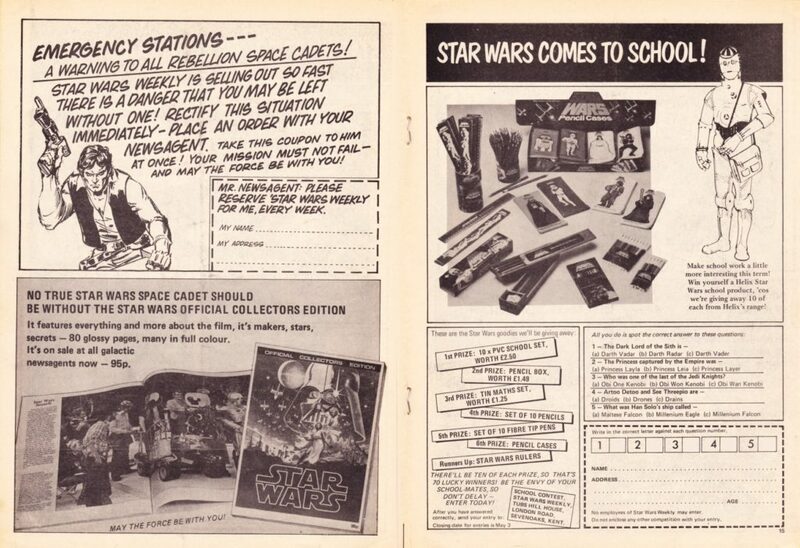 “STAR WARS COMES TO SCHOOL!” along with a drawing of C-3PO in a classic British schoolboy cap and satchel, looking more like Billy Bunter than a protocol droid. 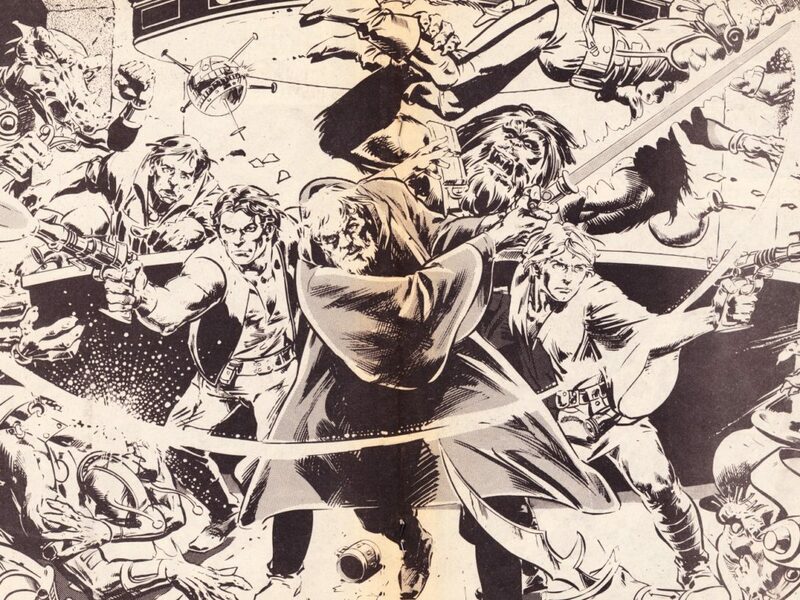 Within this issue’s pages lay adverts and insert pages for other Marvel titles, making sure readers of the day knew that there were other stories happening within the Marvel universe. 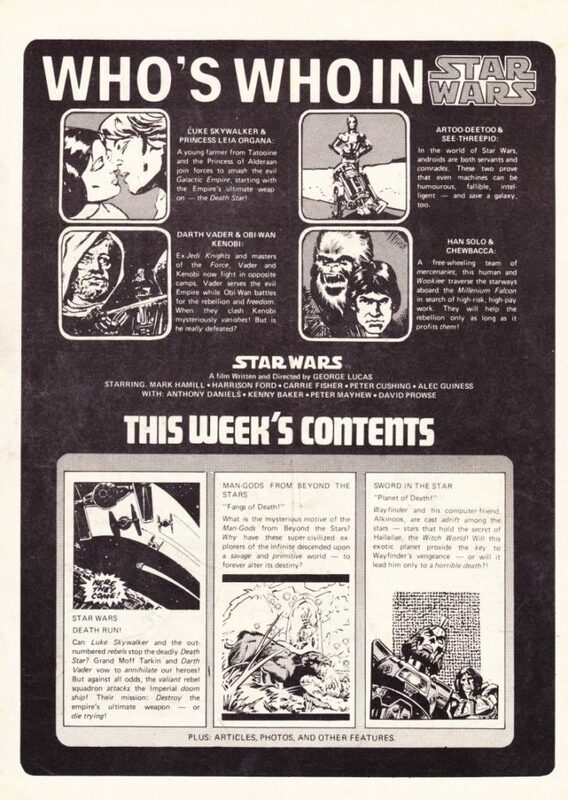 Of course, back in ’78 there was nothing else happening in the Star Wars comics galaxy, so Marvel took the opportunity to load the pages of Star Wars Weekly with back-up stories like Tales of the Galaxy, presented by Stan Lee. 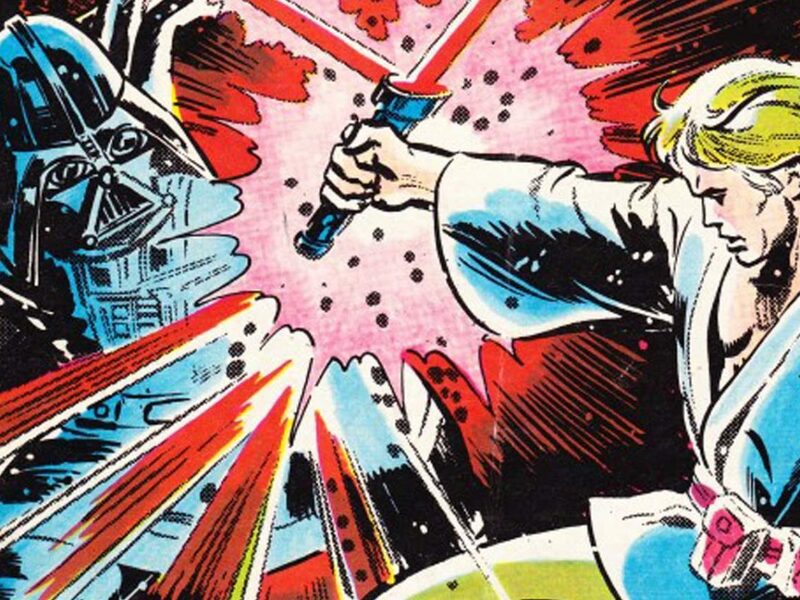 These stories sought to educate young readers, not only on the broader scope of the Marvel universe, but to also do something that Star Wars had itself done — educate the readership on the creative talent behind the scenes. Via these strips, young readers got to know the names of folks like writers Doug Moench and Bill Mantlo, and artists Alex Nino (who provided many of the Pin-Ups seen in the weekly title) and Keith Giffen. It was a good bit of business. 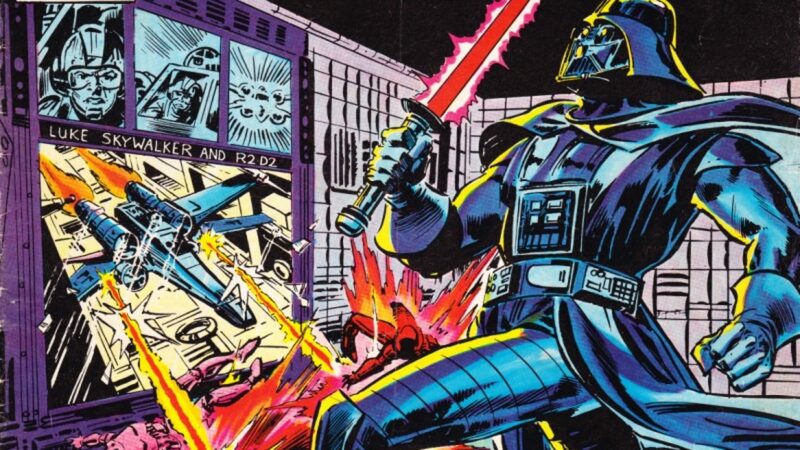 As the Star Wars age went into temporary hibernation in the mid ’80s, many fans turned their collecting attention to Marvel. 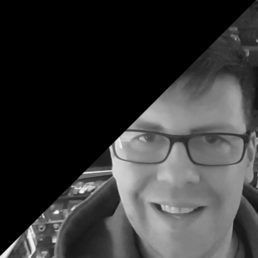 Mark is the owner of Jedi News, has written for Star Wars Insider since 2006, DeAgostini’s Build The Millennium Falcon partwork magazine and co-hosts RADIO 1138 and Take Cover on the Jedi News Network. He’s an honorary member of the Rebel Legion and the 501st and when he’s not talking, tweeting or writing about Star Wars he can usually be found sleeping where he’ll most likely be dreaming about Star Wars.